May 20, 2014  After late wrangling that included a threat to withdraw his guilty plea and an offer to eat poison in a sandwich, J. Everett Dutschke accepted a 25-year prison sentence. December 10, 2013  Ex-actress Shannon Guess Richardson, who had minor roles on The Walking Dead and The Blind Side, says that she tried to frame her estranged husband for the tainted letters. August 2, 2013  The head of the U.S. 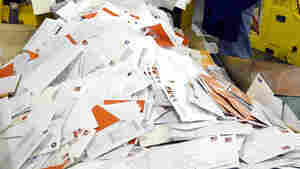 Postal Service says the exterior of billions of pieces of mail are photographed and that the information is sometimes shared with law enforcement. June 7, 2013  News outlets in Louisiana and Texas report that the wife of the man who had been a "person of interest" is under arrest. They were reportedly going through a divorce. She had told authorities her husband might have sent the letters to President Obama and New York Mayor Michael Bloomberg. June 3, 2013  Maximum punishments for the counts leveled against James Everett Dutschke range from five years to life in prison. He was arrested in April on suspicions that he sent letters containing the poison ricin to President Obama and other officials. May 30, 2013  Law enforcement officials say the letter is similar to two that were sent to New York City Mayor Michael Bloomberg. Preliminary tests of the letter to Bloomberg turned up traces of ricin.